Beef Cheek Pastrami Recipe Redux | The Foodist. Humans like pastrami. Thick juicy slabs of it dripping from a toasted sandwich, melty cheese glueing the crimson meat to sharp sauerkraut and sweet russian dressing. Oh it seems I’ve just described my favourite sandwich, the Reuben! But the reality is in the UK the pastrami that we normally encounter is the equivalent to cheap wafer thin ham. Next time you eat any sandwich described as “New York” ask yourself how close are you actually getting to the soft, juicy, meaty, sweet, spicy pastrami or saltbeef of that city. 2. Cooking saltbeef. Take the raw saltbeef out of the brine and simmer it gently in water until tender, around 3hrs. Technical bit: you’re looking to maintain an internal temperature of 90-91C for about 90mins to break down the tough collagen (especially in the cheek). But best test of all is it’s done when a knife slips through easily. 3. 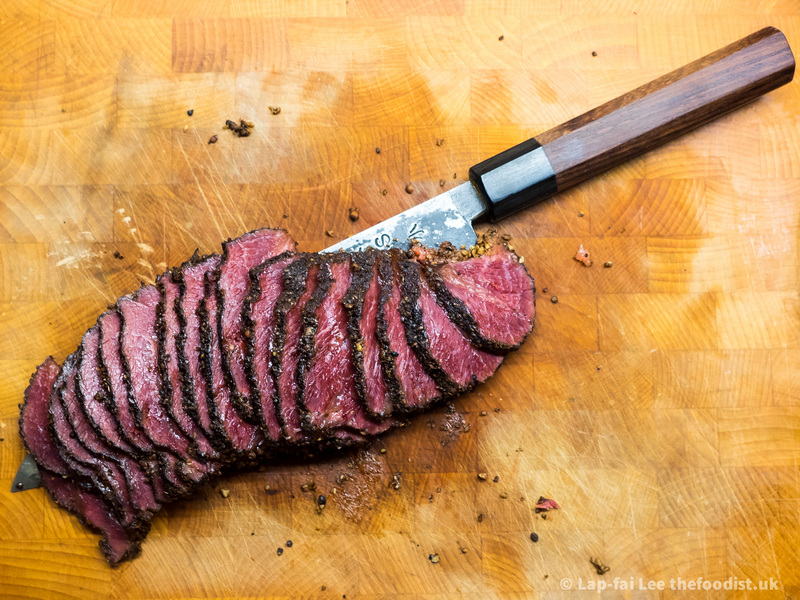 Make the pastrami coating by grinding together 30g of black pepper and 30g coriander seed. Take the raw saltbeef out of the brine, rinse quickly, pat dry and smother it will the pepper/coriander coating. 4. Hot smoke the coated saltbeef for 3hrs at 130C. Use whatever wood you like, oak and pecan is nice. After three hours the internal temp will probably be around 70C. 5. Foil your beef tightly and finish it either on the smoker or transfer it to an oven for another three hours. Or until the pastrami is tender. Again you want to maintain a 91C internal temp for 90mins to break down the collagen. * My original recipe on smokeandumami uses an 11% strength brine (11g salt in 100g water) and quite a lot of it. The beef is then brined for a short 3 days. This recipe redux uses a 5.5% strength brine based on the total mass of water and beef. This way of equilibrium brining uses less liquid, which is good for fridge space. It’s also a lot more forgiving with time, allowing you to leave the meat in the brine with no fear of over brining. Thanks to my mans Nick “Professor Brisket” Loman for laying the theory down. The ratio of bread to filling also differs greatly between the U.S. and the UK. In the UK the bread is the major component of the sandwich. In the U.S. the filling is the major component – many more slices of your chosen meat than you ever see in the UK. Having just spent 3 weeks in the U.S., I found a sandwich at lunch time to be a significant meal, rather than just a snack – because of the significant protein element of the sandwich. I prefer a good balance. Enough filling to be generous but I’m also able to get a proper bite through. Basically about half the meat of a U.S. one. Agree – I’ve seen pastrami and salt beef sandwiches with up to a dozen slices of meat, and not exactly carved wafer thin. Definite overload. Hi Richard, how are you? Pastrami is characterised by the complex savoury smoky flavour so in lieu of hot smoking, maybe some smoke powder in the cure might do it.